Lately, the good contributors of Yelp, Citysearch, and Urbanspoon had all been giving Olympian Burger consistently high marks. Happy Meal and I made the trek to learn what all of the fuss was about. I have learned to take Yelp reviews (and their ilk) with a grain of salt, but the number, tone, and recentness of these positive reviews swayed me to expect greatness from this cheeseburger. Greatness was not what was delivered. The parking was free in the strip mall where Olympian Burgers was located. We ordered a couple of single 1/4 pound) cheese burgers at the front counter and waited for them to call our number. The cost for two cheeseburgers, a beverage, and an order of fries was about $8.50. In about 10 minutes, our meals were ready. The Beef: This was the bottom of the barrel. The beef was pre-ground, pre-formed, probably previously frozen, bland, rubbery, tasteless, dry, chewy, bloodless Chuck. 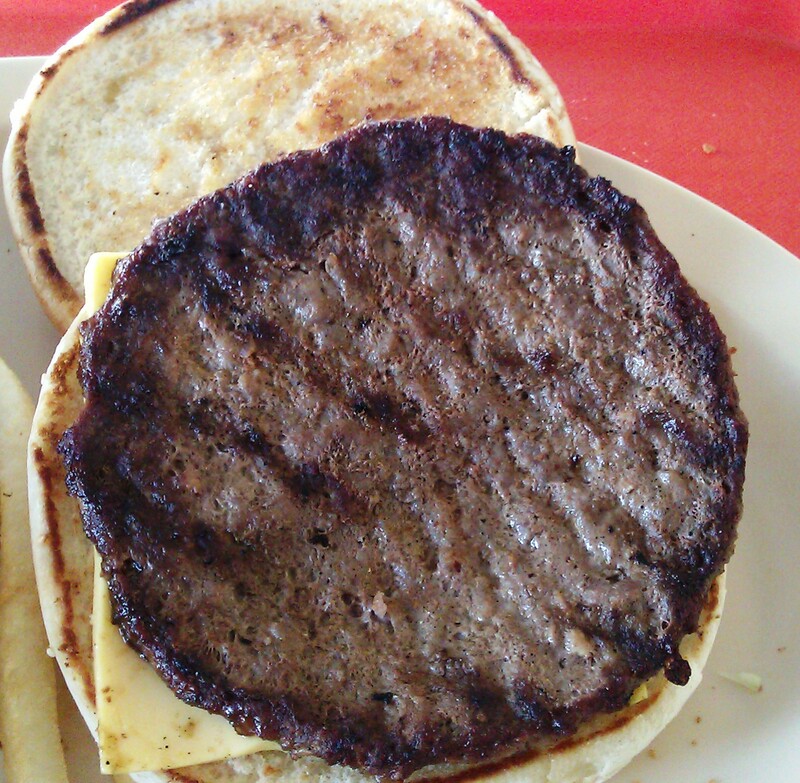 The 1/4 pound patties were beef in name only, because they tasted of nothing. The Sear: Olympian Burgers mercilessly immolated the burger patties over a very hot grill to the point where there was a sear, but this vaporized any of the juices in the beef leaving behind only chewy blandness. There was also a mild char to the patties. This char was the only flavor that the beef contributed, so it was unpleasant. The Preparation: The burger patties had been processed/handled to the point where they were completely rubbery--think rawhide chew toy. The thin, broad patties were cooked so hard that they became lenses, and would have been more suitable for Frisbee golf than for human consumption. The burgers were pressed to rid them of any moisture that the cooking process did not remove. This was a mixed blessing, since the vulcanization process also rendered out most of the fat, excess calories were kept to a minimum. Well-Done was a euphemism for the degree to which our burgers were cooked. The Cheese: A single slice of American cheese did all that it could to contribute flavor and moisture to a dish, which was devoid of both. The cheese failed and died without a sound in its lonely struggle. The Bun: Blah! The bun was a big, stale, over-toasted, seeded hamburger bun. It was dry and tasteless. It served to reinforce the joyless dryness that the kitchen of Olympian Burgers sought to inflict on its patrons. The Meat To Bun Ratio: Not that it mattered, but the bun dominated the beef. The Fries: The fries were pretty good. They were cooked in a hot, fresh oil. They were golden, properly seasoned, and well-crisped. The Value: Even though we spent less that $9.00 to feed 2 people, the value was poor, because the quality of the ingredients and preparation was so low. Don't believe everything that you read...unless you read it here. The only things Olympian about the cheeseburgers at Olympian Burgers were the flame that they were cooked over, the discuses (disci?) that were served in lieu of burger patties, and the Herculean effort required to choke down those palate dessication machines. Burger Review : Not only no, but Hell NO! Olympian Burgers was where bad beef and stale buns went to be punished. We give this place the finger. Rating...2 Bites We were ridiculously hungry and managed to choke down these lousy, dry discs of bleakness, or Olympian Burgers would have received a 1 Bite rating.